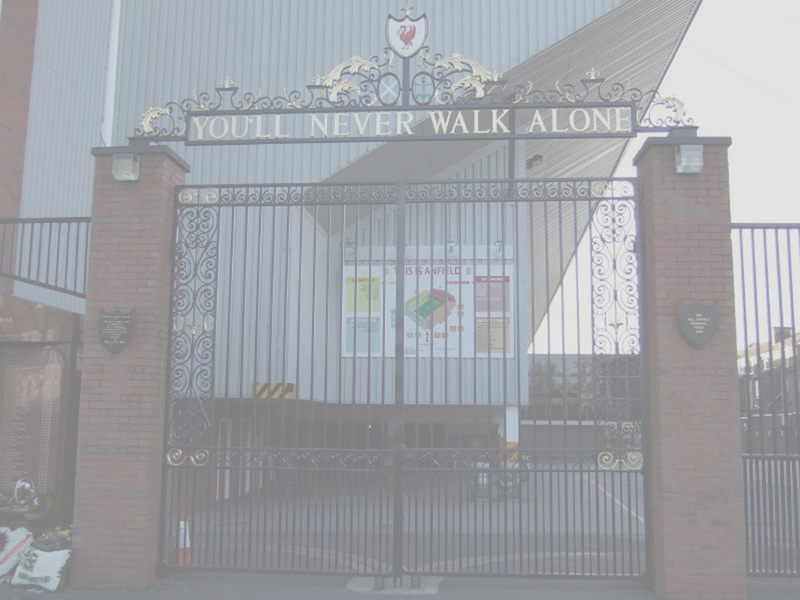 Liverpool won the double in year 1986. 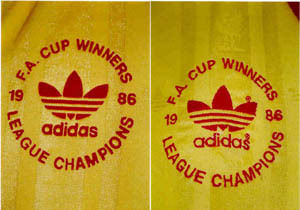 Thus, in the season 1986-1987, a yellow third shirt with special embroidery of double winners was used. 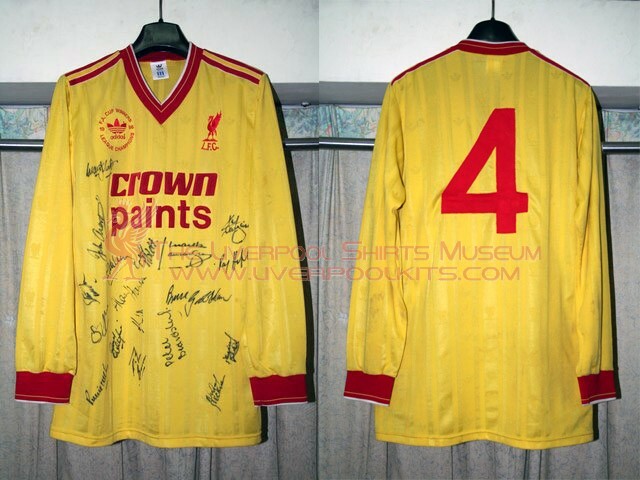 Liverpool 1986-1987 Third Double Winners Player Shirt - Numbered 4 shirt belongs to Mark Lawrenson. There were no long sleeved replicas produced in that era. 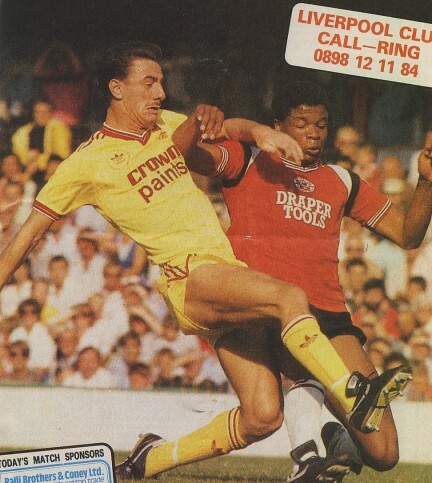 Featured Ian Rush in a yellow double winners third shirt with Danny Wallace in Soton shirt in the away league match played at the Dell. Left: Manfacturer logo and letters are embossed on the replica shirt. Right: Manfacturer logo and letters are embroidered on the player shirt. 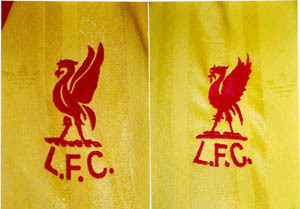 Left: Liverpool club crest is embossed on the replica shirt. 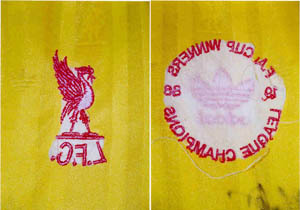 Right: Liverpool club crest is embroidered on the player shirt. 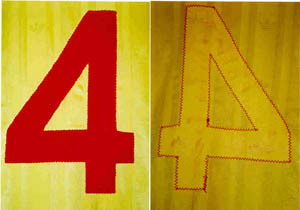 Left: Number on the shirt is the sewn-on type cloth. Right: From the inner side, the effect of sewn-on of number is clear. The effect of embroidery is more conspicous if we view from the inner side. 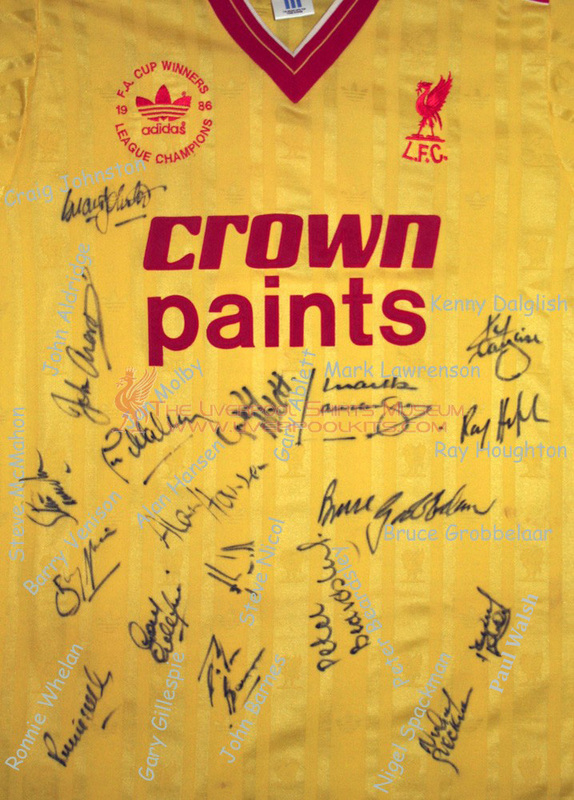 The shirt is autographed by the 1986 double winners season's squad, inclusive of Peter Beardsley, Alan Hansen, Ronnie Whelan, Kenny Daglish, John Barnes, Ian Rush, Gary Ablett, Mark Lawrenson and Bruce Globbelar.